Abstract: With data-centric network traffic growing exponentially at around 60% per year, fiber-optic transport networks are rapidly approaching their fundamental Shannon capacity limits. By 2020, leading-edge network operators will require capacities that are fundamentally impossible to implement using conventional optical transmission technologies. We will explore key technology scaling disparities that are driving the looming capacity crunch in global core networks and discuss their impact on our communications society. We will then point to spatially parallel transmission solutions (Space-Division Multiplexing, SDM) as the only long-term viable solution to overcome the transport capacity scalability bottleneck. We will explore the implications of ultimately unavoidable spatial crosstalk, and examine how multiple-input-multiple-output (MIMO) digital signal processing, well established in wireless communications, can help to scale optical core networks. A look at information theoretic physical-layer security in SDM-based fiber-optic transmission systems will round off our discussions. Biography: Peter J. Winzer received his Ph.D. from the Vienna University of Technology, Austria, where he worked on space-borne lidar and laser communications for the European Space Agency. At Bell Labs since 2000, he has focused on many aspects of fiber-optic communications, including advanced optical modulation, multiplexing, and detection. He has contributed to several high-speed optical transmission records and field trials from 100 Gb/s to 1 Tb/s and has been globally promoting spatial multiplexing to overcome the optical networks capacity crunch. 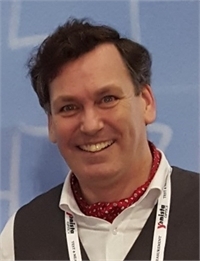 He has widely published and patented and is actively involved with the IEEE Photonics Society and the OSA, including service as Editor-in-Chief of the IEEE/OSA Journal of Lightwave Technology, Program Chair of ECOC 2009, and Program/General Chair of OFC 2015/17. Dr. Winzer is a Highly Cited Researcher, a Bell Labs Fellow, a Fellow of the IEEE and the OSA, and an elected member of the US National Academy of Engineering.